The FORA, the genuine defender of the workers, is celebrating another year today. On May 25, 1901, taking advantage of the holidays for the bourgeois celebration of the "May Revolution", workers organizations from different cities in the Argentina regions met to fulfill their aspirations of creating an organization which would synthesize all its human aspirations of solidarity and liberty. 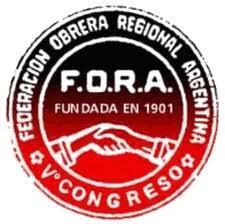 From here, the Argentine Workers' Federation was formed - since 1904 called the Argentine Regional Workers' Federation, which immediately started to grow and promote the organization in all unions and workplaces, identifying the workers with their principles and methods of struggle. We can say without a doubt that while the workers' movement was guided by the ideas of FORA, there was healthy trade union activity in the country, and through the Federation the workers brought their claims beyond mere economic or labor conquests, dedicating all their forces to the revolutionary struggle to end the current state of affairs. 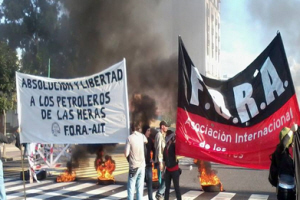 FORA is calling for an international day of protest for the oil workers of Las Heras on March 24. 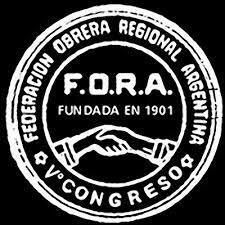 The Regional Workers´ Federation of Argentina is committed to the cause of the workers of Las Heras and we have been making different solidarity actions. We would like all the Sections of the IWA to mobilize and make protests at government offices of Argentina (Embassies, Consulates...) on March 24, (a day which in our country commemorates another year of the last military dictatorship), with the aim of freeing the oil workers of Las Heras. 2006: The oil workers, some of them outsourced, protest against a tax on their earnings, for entrance to the plant and to enter into the collective agreement of the Oil Workers Unions (which would mean a raise in salary). After 20 days of strike, in an act of provocation by the Governor of the province of Santa Cruz, the spokesperson of the workers was detained while speaking on the radio. During the actions in his defense, a police office, Jorge Sayago died. 2007-2008: A hunt follows, looked for the guilty party. People are arrested and tortured. Curfews and the militarization of the town by the Gendarmes. With the statements of those detained in their homes, beaten and pressured, “The Cause” arms itself: the uncle of Sayago, declares that those sitting on the bench, facing charges, are just scapegoats. One of the defense lawyers, Claudia Ferrero, admitted that “there is no concrete evidence), and those that were, were based by the Investigative Brigade of Santa Cruz on torture, terrorizing the whole population and getting false testimony through threats and persecutions. 2009: Militarization and persecution continues in the town of Las Heras. The workers have already been detained for 3 years, in conditions of physical and psychological torture. 2013: The request for life imprisonment of 6 of the accused and 18 years for the rest. The Prosecutor Candia, admits the torture and the illegal mistreatment. At the same time he declares “PUTTING A BAG OVER THE WITNESSES HEAD AND SLAPPING HIM IS NOT THE SAME AS TELLING HIM WHAT TO SAY”. The court turns a deaf ear to the information about torture and leaves the defendants to “reflect and reconsider”. December 2013: four oil workers are convicted for life, CORTEZ, ROSALES, PADILLA Y GONZALES and another 6 workers to 5 years in prison. This is one of the greatest attacks against workers who were fighting for their rights, almost without precedence in constitutional governments, with the goal of punishing the workers' struggle. 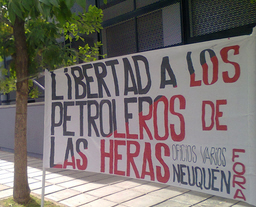 2013-2014: Various sectors of the workers' movement mobilize demanding the amnesty of the condemned oil workers of Las Heras. With every month, more and more solidarity actions take place. In turn, the national government orders the repression and breaking of all the pickets and demonstrations and there are many injured and arrested. Read more about Against the dismissal of Eva Lopez! ¡Contra el despido de Eva López! La Asociación Internacional de los Trabajadores (AIT), por medio de su Secretariado condena rotundamente el despido, por parte de la empresa GFK, de la trabajadora Eva López. Los trabajadores intentaron organizarse para conseguir mejoras en sus condiciones de trabajo, pero el resultado fue la persecución, el acoso, la estigmatización y finalmente el despido de Eva. Este despido ha de ser contemplado claramente como una represalia. La AIT difundirá la información sobre este injusto despido a nivel mundial y no cejaremos en nuestra solidaridad hasta que a Eva López le sea devuelto su empleo. Read more about ¡Contra el despido de Eva López!